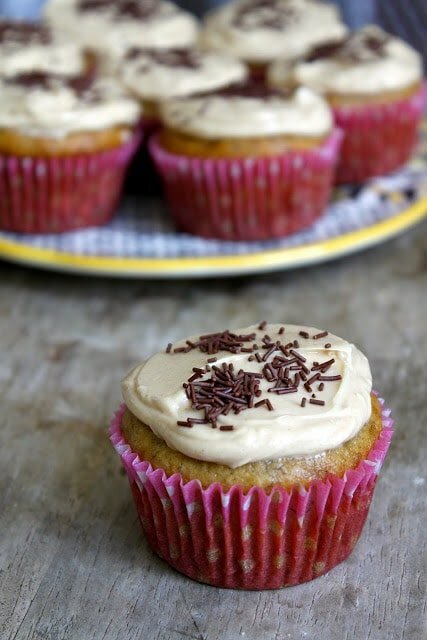 These quick and easy to make banana cupcakes are frosted with peanut butter buttercream and topped with chocolate jimmies. Hello. My name is Maryanne and I am a TV junkie. I admit that I choose to stay home during weeknights because I am addicted to too many shows. I am aware that I can just dvr everything and watch it later. I can’t wait that long. I let the show record for 10-15 minutes before I start watching so I have enough slack to fast forward through commercials. Big sigh of relief to get that off my chest. I’ve grown up my whole life believing that television rots your brains. That is no longer the case. TV doesn’t rot your brains. According to The Walking Dead, Zombies are the cause of rotting brains. Sunday nights are very difficult. I have to juggle Revenge, Downton Abbey, and Girls. On Monday nights, I’m not sure which scares me more- The Bachelor or The Following. Both are addicting and frightening in their own respects. And a new show that I think will become favorite is Monday Mornings. Tuesdays and Wednesdays, I laugh a lot. I love New Girl, Tosh.0, and Modern Family. Smash also started this week but I haven’t decided if I like this season. Also on Wednesdays, Top Chef Seattle. I really hope Sheldon or Kristen win! After the episode, I have to run to my laptop to watch Last Chance Kitchen. By Thursday night, I am exhausted and its time to recuperate for weekend activities. Thursdays are perfect for relaxing, stress free baking. 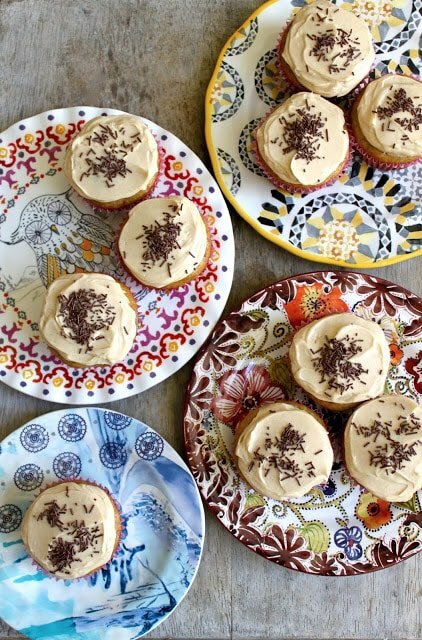 These banana cupcakes are easy peasy. From start to finish (including gathering all your ingredients and washing the dishes), it only takes one episode of The Vampire Dairies. Preheat oven to 350 degrees F. Line muffin tin. Set aside. In the bowl of stand mixer, beat together sugar and oil. Add mashed bananas. Lightly whisk together egg and yolk, then add into mixture along with vanilla paste. Mix until combined. In another bowl, whisk together flour, baking soda, and salt. Add flour mixture to mixing bowl in three additions, alternating with buttermilk. Begin and finish with flour mixture. Add walnuts. Mix until just combined. Divide batter among 12 cupcakes. Bake in preheated oven for 18-20 minutes until cakes are set and done. Let cool in pan for a couple minutes before unmolding and allowing to cool completely on racks. Whisk together egg whites and sugar over a bain-marie. Whisk constantly until mixture registers 160 degrees F on thermometer. Transfer mixture to bowl of stand mixer. With a whisk attachment, whisk on medium speed until soft peaks. The mixture should have cooled to a little warmer than room temperature by this point. With the machine running on med-low speed, add butter a tablespoon a time. Incorporate the fat slowly and ensure the butter is mixed before adding the next tablespoon. Once all the butter is in, add peanut butter and salt and mix on medium high speed. Beat until buttercream is smooth and shiny. 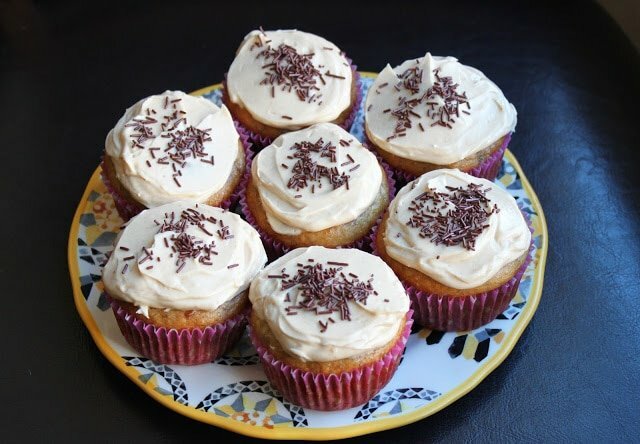 Spread onto cooled cupcakes and sprinkle with chocolate jimmies.